It looks like SpongeBob SquarePants is going to bring the Bubble Bowl to the masses. A few sports journalists prepping for the Super Bowl spotted a video screen with SpongeBob in his Bubble Bowl outfit while Maroon 5 was rehearsing for the halftime show. There has been a lot of talk about the halftime show going downhill over the years and some controversy surrounding the musical selection this year, so the NFL is probably banking on SpongeBob to save the day. SpongeBob creator Stephen Hillenburg sadly passed away at the end of November from cardiopulmonary failure due to ALS. His ashes were spread across the Pacific Ocean and fans started a petition to bring SpongeBob to the Super Bowl. In a landmark episode of the hit Nickelodeon series, titled Band Geeks, SpongeBob and crew deliver the performance of their lives at the Bubble Bowl, channeling every radical stadium rock band in the process. The episode is a fan-favorite, and it looks like Hillenburg will get a shout out during the big game today. "Sweet Victory" is finally going to get the attention that it deserves. SpongeBob is the perfect idea for the Super Bowl halftime show, but many are convinced that Maroon 5 isn't. Several huge acts were approached before the band, including Rihanna, Pink, and Cardi B, but they all passed on the opportunity to stand with Colin Kaepernick, the former NFL quarterback. Kaepernick was blackballed from the league for kneeling during the National Anthem to bring attention to police brutality and racism. Maroon 5 are donating to the Big Brothers Big Sisters of America, but people are calling them out for "crossing the picket line." Bringing in SpongeBob could be a way to help ease the tension. NFL fans have been upset at the league for a number of years and the Colin Kaepernick controversy still looms large over the world of football. With that being said, even people boycotting Maroon 5 are going to be tuning in to watch the Super Bowl. It's been estimated that over 100 million people from all over the world will have their eyes glued to the TV to watch every touchdown and big commercials. 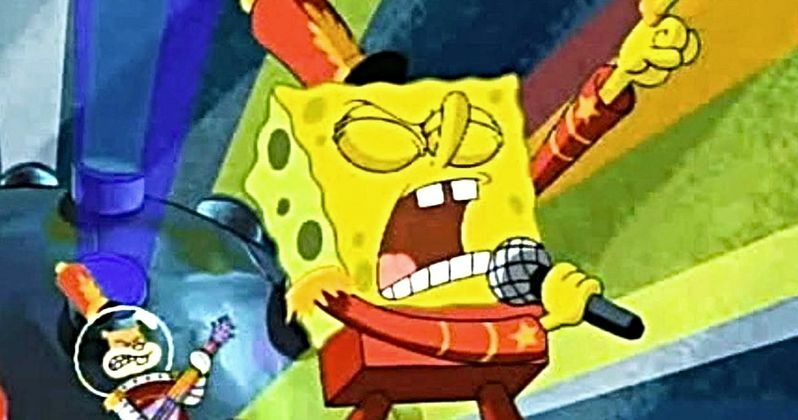 While SpongeBob will be at the Super Bowl, it's not clear how much of "Sweet Victory" we will get to hear. When all is said and done, this should be looked at as a tribute to the late Stephen Hillenburg for bringing the awesomely wacky world of Bikini Bottom to life and making a cartoon that children and adults could enjoy. Pepsi is the official sponsor of the halftime show, so we'll probably see a lot of that on stage with Maroon 5 and SpongeBob as millions of people dive into beers and junk food to celebrate the NFL. You can check out some leaked images from the halftime rehearsals below.